A room in a London basement, the paint effect to the walls was developed with gold and red refractive iridescence metallics to emulate the characteristics of the shot silk warp. 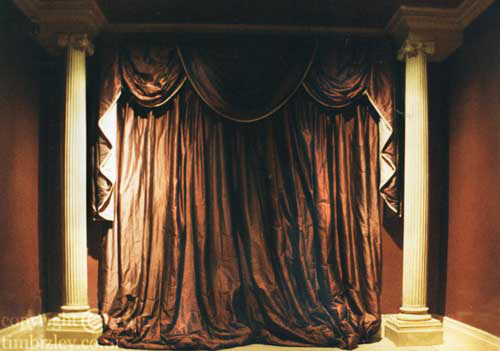 The faux stone work columns worked in gold ochre linked to the curtains weft and lining colour. Specialist decoration techniques can produce highly distinctive interiors which imbue rooms with character and presence. For interior designer London UK.